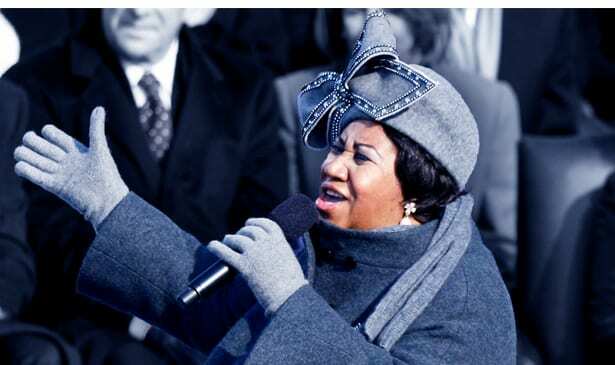 Aretha Franklin performing at the inauguration of President Barack Obama at the U.S. Capitol in Washington D.C. on Tuesday, Jan. 20, 2009. Long before anyone realized Aretha Franklin was a rare music jewel, she helped draw neighbors to her father’s Baptist Church in Detroit as one of the Franklin sisters performing at the small, yet popular, Bethel Baptist Church pastored by the Rev. C. L. Franklin. “We would avoid going to our church near by (Tabernacle Baptist) to go hear the Franklin sisters,” said David Williams, recalling his younger days in the Motor City, his hometown and the city where he grew up. Little did Williams, now Vice Chancellor of Vanderbilt University, or his friends know they were getting an early glimpse of a young church singer who would go on to record hundreds of hit records that sold millions, sing for three U.S. Presidents and the Pope, not to mention fill the house whenever she gave performances in downtown Nashville at the Municipal Auditorium. “We had no knowledge she would be big time,” said Williams, who attended Mumford High School and grew up in Detroit among a generation of emerging entertainment stars. “A little bit of us died” when Aretha died, he said. “Her death was just a little different,” he said, echoing others. Williams was among many touched in recent days by Franklin’s passing. She died of pancreatic cancer. He death was noted by front page news stories in The New York Times and Washington Post, among many, headlined by television networks. She was remembered fondly at recent concerts around the country, including a salute from The O’Jays and Gladys Knight while performing at Washington’s Wolf Trap concert theater. “There’s probably never going to be anyone like her,” said Nashville singing entertainer Charles ‘Wig’ Walker, a Pearl High school alum who met Aretha when she first came to Nashville to perform and saw her again when he moved to New York City to pursue his singing career. “Those kind of people you just idolize,” he said of Franklin. “They have so much talent,” he said, expressing admiration. Walker was a good friend of Curtis Ousley, the saxophonist who was a lead musician in many of her early recording sessions. Indeed, Franklin paid several visits to Nashville early in her career, according to newspaper records held in the archives of the Nashville Public Library downtown. The library showed her listed in 1967 as one of nearly half a dozen acts ahead of “Mr. Excitement” Jackie Wilson, also a Motor City legend. Later, in 1968, radio station WMAK-AM, at the time led by “Rocket 98” DJ Noel Ball, presented “Aretha Franklin in Concert” at the Municipal Auditorium. Tickets costs $5.00 in advance and $5.50 at the door according to library records. Franklin was boosted in the mid-60’s when her recording contract with Columbia Records expired and she switched to Atlantic Records. Atlantic wanted to tap her soul roots blending her gospel background, ability to sing soft and smoothly as she did at Columbia, with gritty rhythm and blues. They started out recording rhythm and blues music with a small, obscure, Muscle Shoals, Alabama studio group, about 115 miles due South of Nashville to record with Muscle Shoals. Her songs became instant hits, and were blasted over Nashville radio from WVOL to WKDA to WMAK to WLAC, the 50,000 watts A-M station that reached more than 30 states at night. “She was a great entertainer with a beautiful voice,” said Lorenzo Washington, founder of the Jefferson Street Sound music museum. “She was just a regular person,” Washington said, echoing others around the city and the nation. Veteran news columnist Dwight Lewis, an East Tennessee native who spent years writing for the Nashville Tennessean before he retired recently, said he acquired a special appreciation for Franklin while attending a national workshop in the 1990’s in Florida for column writers. The noted leader of the workshop, Roy Peter Clark, told the class he learned about column writing listening to two versions of the song Respect—the original version by song author Otis Redding and the cover of the song by Franklin. Both interpretations of the Redding song were quite different, yet they spoke with confidence and clarity. Lewis said Clark told the group. As he listend to the songs, as he still does, Lewis said he gets the point. “How much feeling can come out of one human being?,” said Michael Gray a senior editor at the Country Music Hall of Fame and the music historian at the museum who has focused on the history of Black music in Nashville. “You can’t overstate Aretha’s brilliant musical talent, her innate charisma and soulfulness, and her contributions to American arts and culture,” said Gray who grew up in Detroit and recalls Franklin as his primary introduction to soul music in the 60’s. “…after decades of listening to countless records across all genres of music, I still feel she has very, VERY few equals,” said Gray. For sure getting people to volunteer their favorite Franklin song was a tough question to answer. Most, like diner owner David Swett, offered a humorous version of the song offered most: Respect. As he was explaining which Franklin song he liked most, Swett proudly said Respect, a song he remembers back to his junior high school days. Why that song, he was asked?